NEW DELHI- Britain should not wait until it leaves the European Union to develop deeper trade ties with India, Prime Minister Theresa May said in New Delhi on Monday, promising to ease access for Indian business travellers but not for its students. Making her first visit to India since taking office in July, May described the potential of the British-Indian relationship as “limitless” and announced a scheme to make it quicker and easier for Indian business travellers to clear passport control. 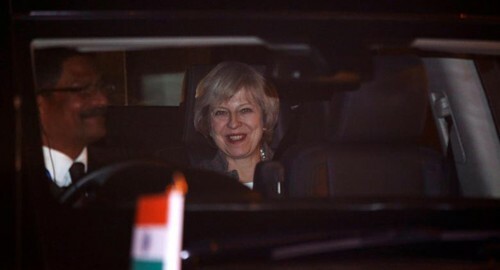 “I will be discussing with Prime Minister Modi how we can increase the detail and depth of our trade and investment discussions, and identify what more we can do, now, to unleash our businesses, industries, exporters and investors,” May told an India-UK Tech Summit in New Delhi at the start of a two-day trip that will take her on Tuesday to the tech hub of Bengaluru. Modi said it was vital that India and Britain work together to define the knowledge economy of the 21st century, and invited UK partners to get involved in his signature policy initiatives such as his plan to develop 100 “smart” cities. He also called for “greater mobility and participation of young people in educational and research opportunities” – an apparent reference to the sharp fall in the number of Indian nationals studying in Britain since 2010. Some of May’s cabinet colleagues and business leaders in both countries have urged May to exclude foreign students from Britain’s statistics on net migration, which May has vowed to bring below 100,000 a year, from 336,000 in 2015. May said it was “crucial” that those who do need to travel between UK and India for business can do so, but she indicated earlier that she saw no reason to change the UK visa regime.